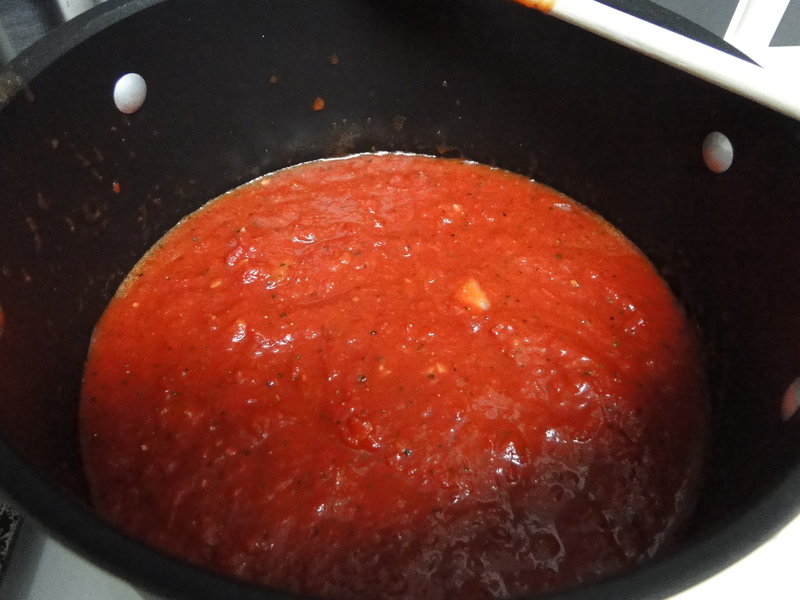 I love this homemade spaghetti sauce recipe – it is a little time consuming, but most of the time is spent with the sauce simmering away on the stove top while you relax or do other things in the kitchen. The worst part of this recipe is really just chopping your garlic. A tip for you: Washing your hands with baking soda helps take away the lovely garlic smell. 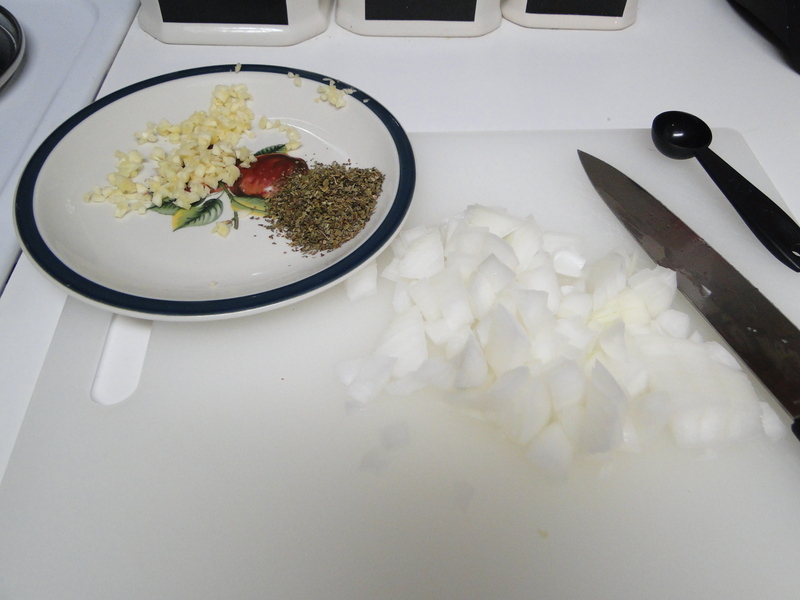 I’ve adjusted the original recipe just a bit for our personal taste preferences – the only difference is that I added half a chopped onion, omitted the grated parmasan cheese, and used less dried basil. Step 3: Add crushed tomatoes, pepper, and sugar (you can add more or less sugar depending on your personal preference. 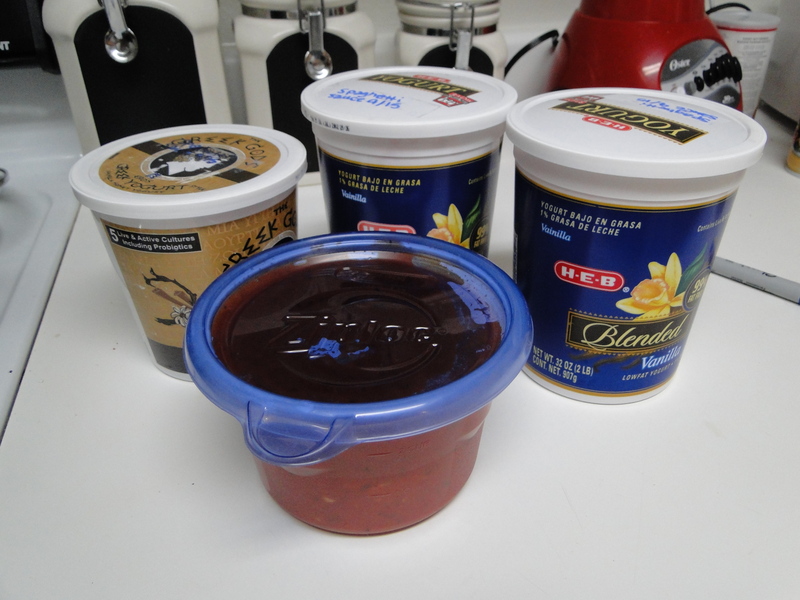 I think the 1 tablespoon tastes just fine). Stirring often, bring to a low boil. Step 4: Reduce heat to low and simmer for 2 to 3 hours, stirring often. For the first half of the simmer time, do so with the pot uncovered, and then cover. Step 5: If you are adding the cheese, do so after the sauce has cooked for 3 hours and simmer for an additonal 5 minutes. A tip for the grated parmasan: get a block of parmasan cheese and grate it yourself so that it is fresh and delicious. 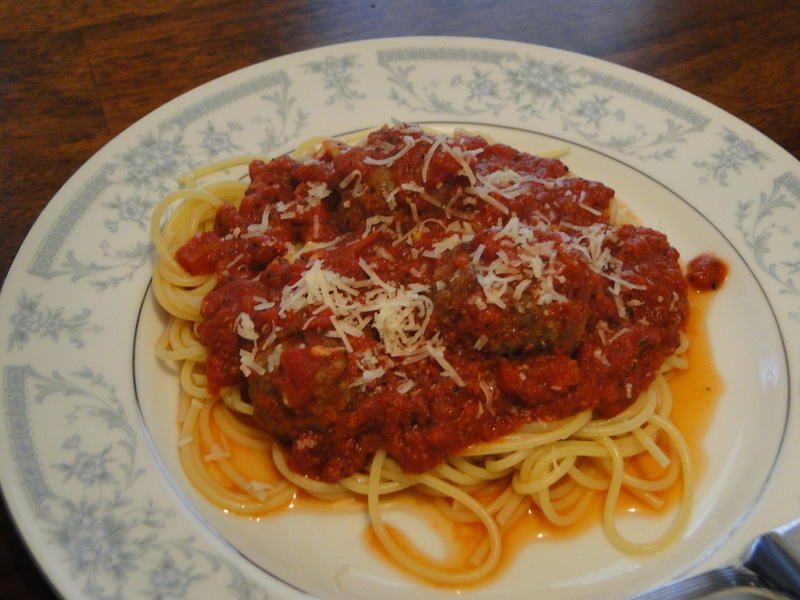 You can use the rest of the cheese to make meatballs and to top on the spaghetti. 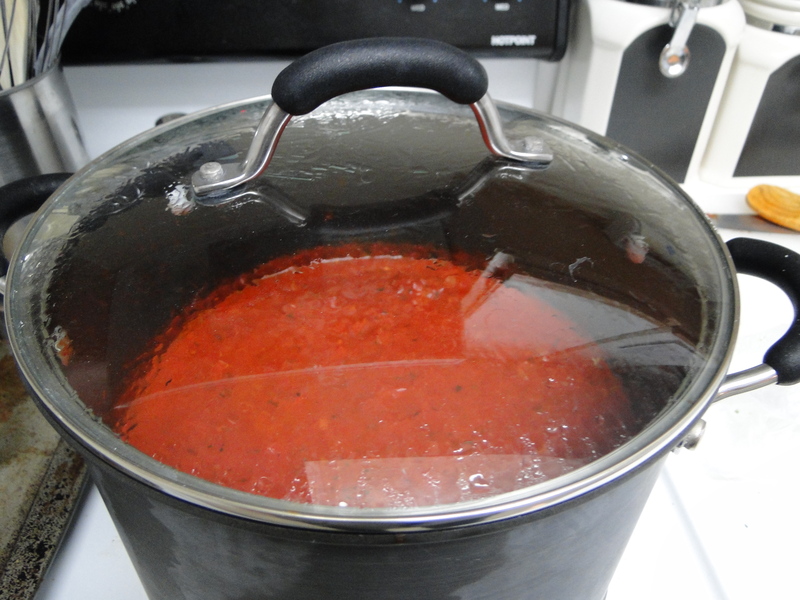 This makes a huge batch of spaghetti sauce which is great for freezer cooking. 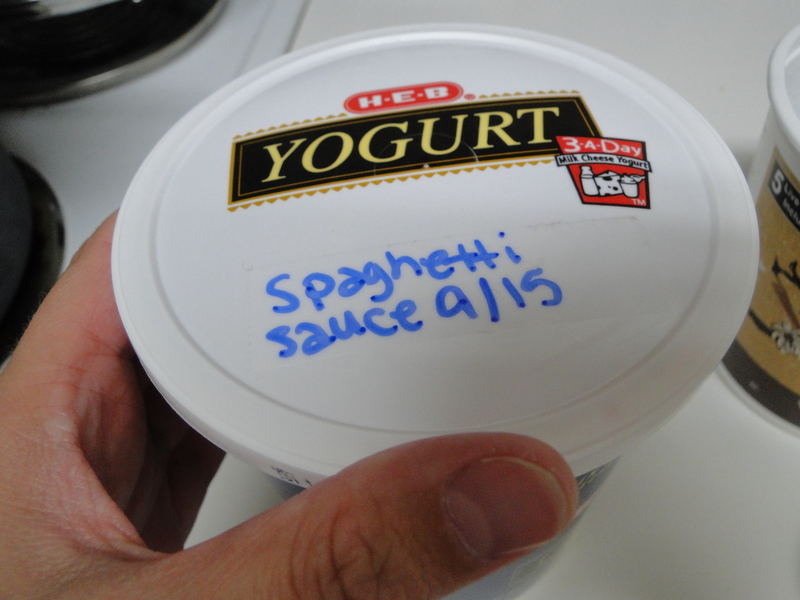 I used to eat yogurt and I saved my yogurt containers for freezer storage – it works perfectly for my spaghetti sauce. I forgot to take a picture of the spaghetti that we had for dinner this week, but thankfully I have a picture from before where I made spaghetti and meatballs. I didn’t make meatballs this week, but I’ll share that recipe soon as well. Heat the olive oil in a large pot over medium heat. Add the chopped garlic, onion, and dried basil and heat for 1 to 2 minutes. Add tomatoes, pepper, and sugar. 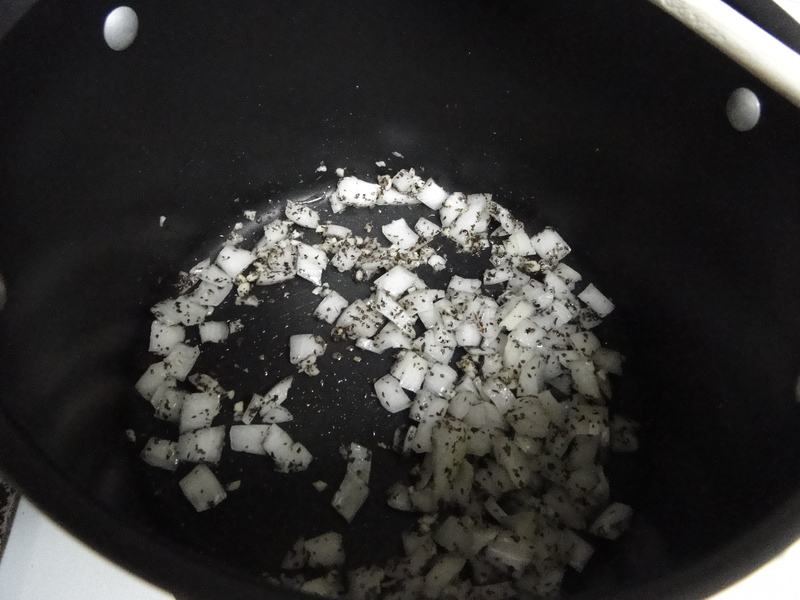 Stir often and bring to a low boil. Reduce the heat to low and simmer for 2 to 3 hours, stirring often. For the first half of the simmer time, do so with the pot uncovered and then cover the second half. Add the cheese and stir in and simmer for an additonal 5 minutes. I’d like to start doing a weekly series (possibly every other week depending on the stress of my work week) sharing my groceries and meal plan for the week. I like to plan meals that are healthy and frugal and now that I’m a working girl, planning has become an even more important part of my life. Spending extra time on the weekend doing meal preparation can be a huge factor in keeping our budget low and our bodies filled with healthy nutrients. When I don’t take the time to meal plan and do food preparation for the week, I have found that we end up going out to eat. This is hard on the budget and obviously horrible for our bodies. 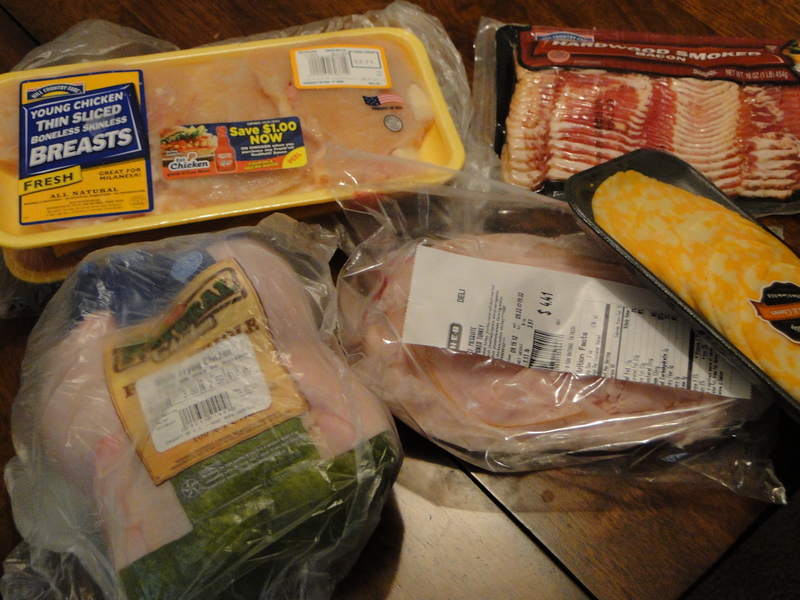 Whole chicken, chicken breasts, bacon, turkey and cheese (for my husband’s work lunch – he doesn’t have access to a microwave because he is a police officer. Otherwise, I would send him leftovers). Eggs, bread (for my husband’s work lunch) and brown rice. We spent a total of $52.28. 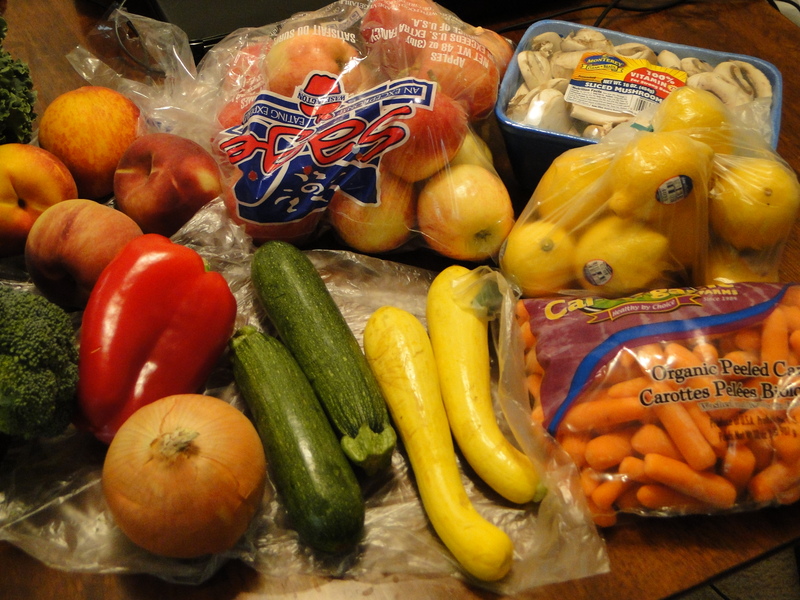 Now I would like to add that I already had some items leftover in my pantry that will be used in this weeks meals. 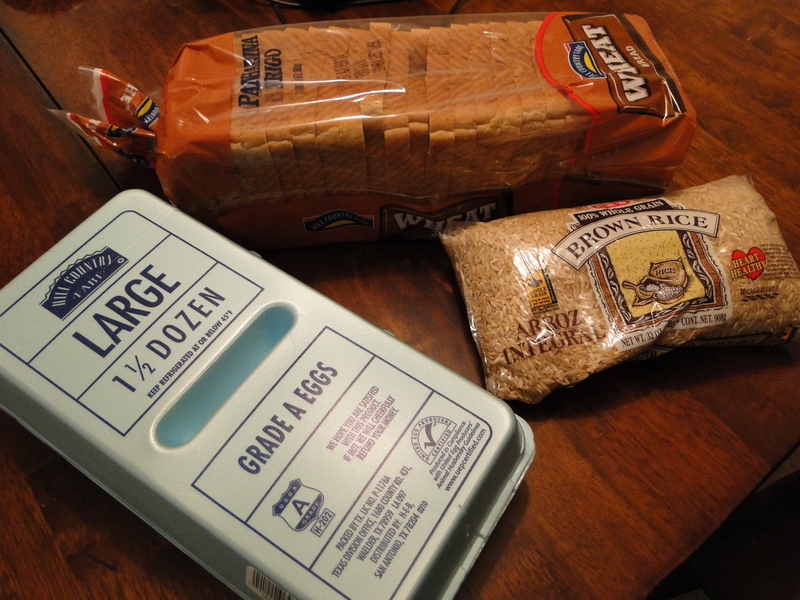 My grocery budget will fluctuate depending on what I already have in stock, though I will usually try to plan based on items that I have in my freezer or pantry. Breakfast for the week will be oatmeal or scrambled eggs and vegetables with bacon. 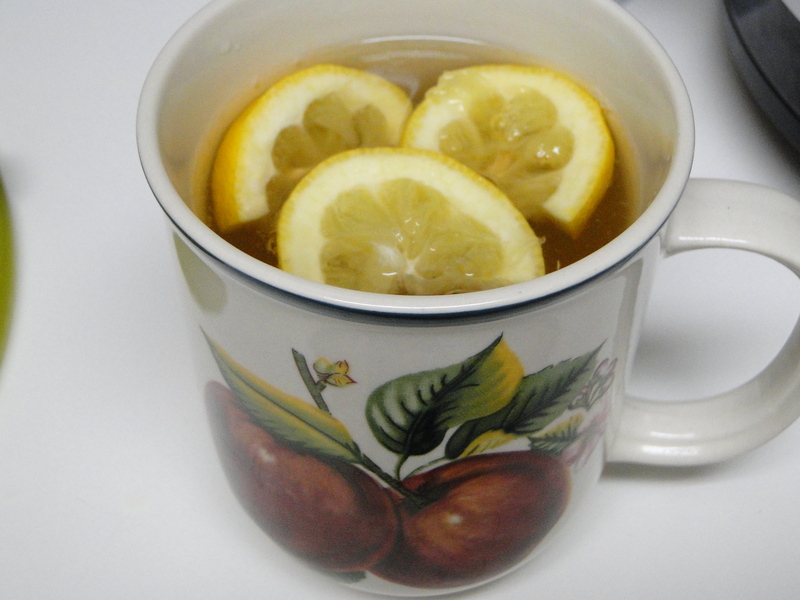 In the morning, I also like to have a cup of hot water with a tablespoon of local honey mixed in and sliced lemons. Lunch for the week will be either leftovers from dinner, a kale salad with shredded chicken from the whole chicken and olive oil for dressing with soup made from homemade chicken broth (also from the whole chicken). 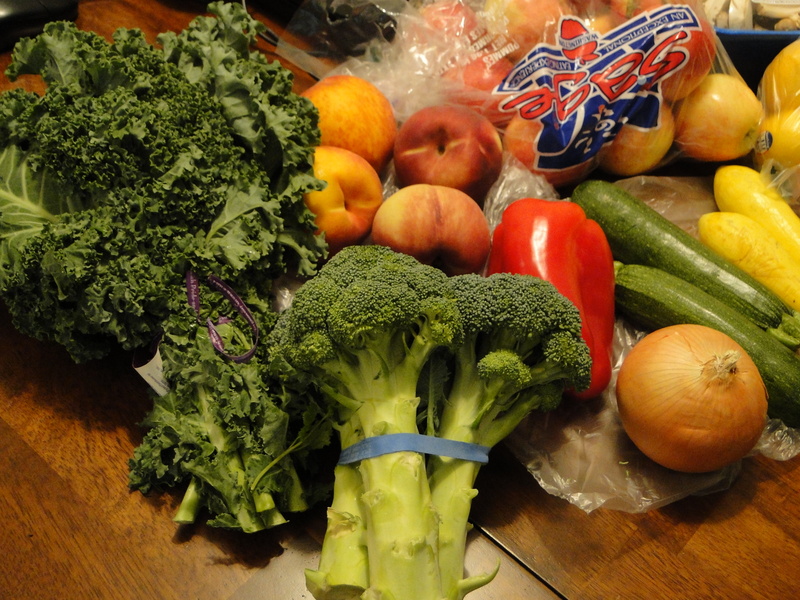 We can also have various vegetables and nuts to snack on (we had leftover pecans, walnuts, and almonds in our pantry). When my husband is working he takes a turkey and cheese sandwich, carrots, an apple, and homemade trail mix (almonds, pecans, walnuts, and raisins). He also has 2 camel backs that he drinks to stay hydrated. Do you like to meal plan and do you find that meal preparation helps you? Share your tips in the comments below. When my husband and I first married, we realized pretty quickly that we needed to come up with a budget and learn how to cut back on spending. Thankfully, I had spent months prior to our wedding, doing research on cooking and frugal living. We reduced our minutes to 500 minutes a month. My husband was worried that we would go over minutes at first, but we’ve never even come close to going over. We save $70/month. That’s $840 a year. We got rid of cable. We save $80/month not having cable. Instead we use Netflix and if there is a show that I really want to watch, I’ll purchase it on amazon instant video. I use swagbucks to get amazon gift cards (more about that later). We rented movies from home instead of going to the movie theatres. We got lucky, however, and we get to see movies for free at the theatre because my husband is a police officer and they give officers for our city two free tickets. It’s pretty awesome! We don’t go out to eat unless it is a special occasion. If we want to do something fun, we try to plan a frugal event. Last week we went window shopping and we also took a drive out into the country and looked at stars. Staycation. It’s a vacation but at home! Basically you just do things that you normally wouldn’t do. By not having cable we save $80 a month. That’s $960 a year! Menu planning. If I don’t get organized and plan a menu and grocery shopping list, I always end up spending more money. Cooking and baking from scratch. It was a little expensive when I first started just because I had to build up my stock and purchase kitchen supplies, but it paid off. No fast food. It might seem cheap, but it adds up quickly. Plus, your health will end up costing you more down the road when you get sick. We don’t buy bottled water. We drink from the tap. We don’t buy sodas – again we just drink water. We don’t buy packaged items. Candy, chips, frozen dinners, etc. If I want something sweet, I bake it myself. We save $300/month (possibly even more) by eating from home. That’s $3,600 a year! We save about $42/month by doing things ourselves. That’s $504 a year! We buy used clothing and other items second-hand. I’m not sure how much we save because we generally just try not to shop and use what we have until we actually are in need. We save about $130/month. That’s $1,560 a year! Hopefully I didn’t forget anything here. By making little sacrifices here and there we are able to save a total of $622 a month. When you add that up over the course of a year, we save a grand total of $7,464! That is a nice chunk of change. If you have debt to pay off, you can make a huge difference in just one year. I also like to think, that if we continue to live a frugal lifestyle over the course of my husband’s career, in 30 years, we can save $223,920! That is amazing – don’t you think? You can help feed a lot of hungry people with that money saved. I LOVE IT! Cloth diapers. We don’t have a baby yet but when we do I will be investing in cloth diapers. I’ll do a cloth diaper series in the future to talk about this great money-saving option and how easy it can be. Making homemade baby food. Again, I don’t know much about this, but it will be something that I do when the times comes. Second hand shopping. Thrift stores, consignment stores & consignment events. If you have young children, this is a must. They grow out of their clothing so quickly. Clothing swaps: Here’s a post from one of my favorite Christian bloggers, Courtney at womenlivingwell.org. She and her girlfriends had a clothing swap and it looks like a great way to get new-to-you clothing and also a great way to enjoy a fun night with the girls. Selling items that you don’t want anymore: think eBay, Craigslist, garage sale, consignment shops and consignment events. Now, I would like to add something from a spiritual perspective. Sometimes I’ll refer to the frugal things that we do as sacrifices, but the truth of the matter is that we are so very blessed. We have more than we need while many people in the world don’t even have clean drinking water or food to eat. There are parts of the world where children die of starvation before the age of 5. If you are ever lacking in motivation to live a frugal lifestyle, just remember that the choices you make with your spending, could bless someone else. We have a lot of credit card debt, student loan debt, and medical bills to pay. Sometimes when I am focusing on just paying off the bills, it can feel overwhelming. But then I remember how truly blessed I am, and I remember that because I have been given much, I have a great responsibility to give much to others. The sooner we take responsibility and pay off our debt, the sooner we can be more generous with what God has graciously given us.